When my son was born, I was in no hurry for soap. "Wait on soap until you can't get the food out of his hair," advised midwife Gretchen. Good words. When your baby is ready for soap, this is the bar. 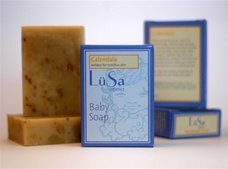 Mild, gentle, moisture-drenched, and laced with calendula blossoms. The perfect bar for baby's for diaper area. Also lovely as an adult facial bar. Calendula Baby Soap Ingredients: Saponified oils of *palm, *coconut, *avocado, *olive, and *jojoba; shea butter (fair trade), and *calendula flowers. Sleeping Potion Calendula Baby Soap Ingredients: Saponified oils of *palm, *coconut, *avocado, *olive, and *jojoba; shea butter (fair trade), *calendula flowers, and essential oil blend (lavender, tangerine, chamomile, and ylang ylang).